Federal and state laws have been designed to protect disabled individuals from discrimination. Notably, the Americans with Disabilities Act (ADA) and its subsequent amendments provide legal recourse to aggrieved parties. Frequently, the Equal Employment Opportunity Commission (EEOC) pursues litigation on behalf of individuals when it believes their rights have been violated. Here’s what employers should know, including three new cases that provide valuable reminders of potential pitfalls to avoid. 3. You’re believed to have a physical or mental impairment that lasts or is expected to last six months or less. Disability discrimination occurs when an employer covered by the ADA or another law treats a disabled employee or job applicant unfairly. A violation may also arise when an individual has a history of a disability or an impairment that isn’t temporary or minor. The ADA even protects an individual from discrimination based on his or her relationship with a person with a disability, such as when an employee’s spouse or child is disabled. Harassment. It’s illegal to harass an employee or job applicant if he or she has a disability, was previously disabled, or is thought to have a physical or mental impairment that isn’t transitory (in other words, lasting or expected to last six months or less) or minor. Harassment may include offensive remarks about the person’s disability that are frequent or severe enough to create a hostile work environment or result in an adverse employment decision (for example, the victim being fired or demoted). The harasser may be the victim’s supervisor, a supervisor in another area, a co-worker, or even a client or customer. Failure to make reasonable accommodations. A reasonable accommodation is any change in the work environment, or change in the way things are usually done, to help a person with a disability apply for a job, perform job duties, or enjoy employment benefits and privileges. Examples include making the workplace accessible for wheelchair users or providing a reader or interpreter for someone who’s blind or hearing impaired. However, an employer doesn’t have to provide accommodations if doing so would cause undue hardship. This means if the accommodation would be too difficult or too expensive to provide, factoring in the employer’s size, financial resources and the needs of the business. But an employer can’t refuse to provide an accommodation just because it involves some cost. Requests for medical exams. 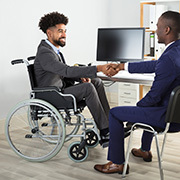 The ADA imposes strict limits on employers when it comes to asking job applicants to answer medical questions, take a medical exam or identify a disability. For instance, an employer can’t ask an applicant to take a medical exam before extending a job offer or ask if the applicant has a disability (or about the nature of an obvious disability). If a job is offered, an employer may condition the offer on the applicant answering certain medical questions or successfully passing a medical exam, but only if all new employees in the same type of job must answer the same questions or take the medical exam. Believes the employee is unable to perform a job successfully or safely because of a medical condition. The ADA also requires employers to keep all medical records and information confidential and in separate medical files. Three recent cases show how the EEOC pursues litigation relating to disability discrimination under the ADA. 1. Denied medical leave. The EEOC has initiated a legal action against a South Carolina pest control and landscaping company that operates service centers in seven states. The company allegedly violated federal law when it denied an employee’s request for medical leave and then fired her after learning about her medical condition. According to the EEOC lawsuit, the company denied the request by the employee for leave after she became hospitalized due to her disability. Instead, the company terminated her employment. The EEOC further alleges that the company actively recruited other candidates for her position as office manager. It also claims the company subsequently refused to rehire the employee for the vacant position in retaliation for her accommodation request. After first seeking to reach a pre-litigation settlement, the EEOC then asked for back pay and compensatory and punitive damages for the employee, as well as injunctive relief designed to prevent future discrimination. 2. Involuntary leave policy for disabled workers. The EEOC claims that a large trust company has a long-standing policy and practice of placing employees with impairments or disabilities on involuntary leave until it receives their medical providers’ clearances to return to work without any restrictions. As a result, qualified individuals with disabilities were denied reasonable accommodations and put on involuntary leave or discharged. This alleged wrongdoing affected employees in New York, New Jersey and Connecticut. For example, a teller in Harrison, New York, was prescribed a walker boot to treat Achilles tendonitis and bone spurs. Instead of simply allowing her to wear the walker boot, which wouldn’t have affected the essential functions of her job, the company placed her on involuntary leave and then fired her. In addition to the $700,000 award for lost wages and other damages, the settlement includes a two-year injunction against discriminatory policies or practices. The company must also adhere to certain training and notification requirements. 3. Rescinded job offer due to medical condition. A global corporation headquartered in Georgia manufactures, distributes and sells stored energy components. An EEOC lawsuit claims that the corporation violated federal law when it rescinded its job offer to an applicant after it learned that he suffered from a medical condition. The lawsuit states that the corporation made the plaintiff a conditional job offer as a machine operator at one of its Georgia manufacturing facilities. When the applicant went for a post-offer physical, the corporation learned he had chronic kidney disease. As a result of unfounded fears about his ability to perform the job safely, the EEOC alleges that the corporation unlawfully rescinded its job offer. The EEOC says that the alleged conduct violates the ADA. After first attempting to reach a pre-litigation settlement through its conciliation process, the EEOC is seeking reinstatement, back pay, and compensatory and punitive damages for the plaintiff, plus injunctive relief designed to prevent future discrimination. These recent EEOC cases demonstrate that employers must strictly observe the ADA and other relevant laws. Even unintentional violations may result in significant penalties. Reach out to your HR advisors and employment attorney if you have any questions pertaining to these matters.